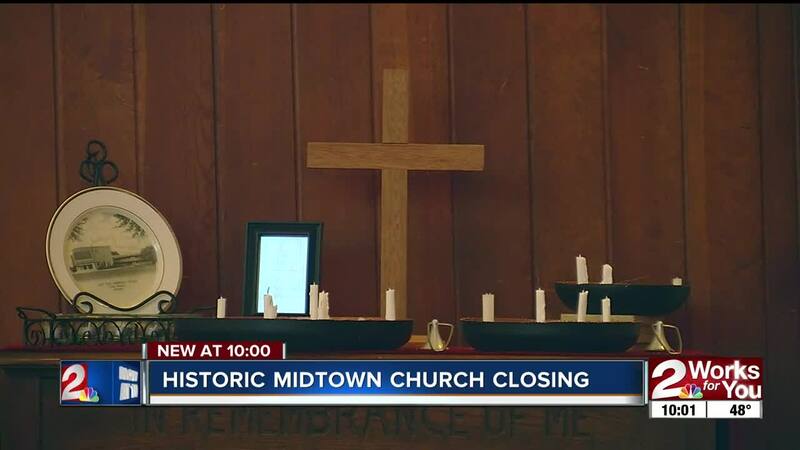 TULSA -- A church in Midtown made the tough decision to sell their historic building, but they're not saying goodbye. They're being welcomed into another church in south Tulsa. "We don’t want to just close and disperse, we want to do this as a family," said Rev. Evan Taylor, with East Side Christian Church. Memories have been captured in several photo albums, dating back to the 1940s. "I had a phone call today from an older gentleman who was baptized here in the '40s. The East Side Christian Church at 15th and Indianapolis has been through a lot over the years, including a fire in the late '30s. "Sat bundled up in coats and sat on paint cans and ply wood and had church in here for the first time," said Rev. Taylor. Then, Mother Nature left her mark on the church about four years ago. "Microburst came down the street and tore the roof of part of our balcony and flooded part of it," said Rev. Taylor. They kept rebuilding while preserving what they could like their iconic red seats from the original design. While they hold on to history, this church is proudly progressive and accepts all walks of life. "That’s sometimes welcomed, sometimes not, we’ve had our hiccups with that but in the end we’re better people for it," said Rev. Taylor. Rev. Taylor says with bills piling up and the cost of living rising, the congregations has spent years asking themselves questions. "Am I giving to a building, or am I giving to a community?" said Rev. Taylor. East Side Christian Church passed out a note to their congregation, and while it is emotional, it’s not a goodbye letter, but an announcement that they’re merging with this church in south Tulsa. "When you walk through the door there’s people that will greet you with a smile on their face," said Gary Bray, a member of Forest Park Christian Church. While every church is different, members of the congregations attended each others services, and they think it's a good match. "We enjoyed both of them obviously so we’re looking forward to this," said Bray. While East Side members are saying goodbye to a building, they say it's what's happening inside that matters. "The actual church is really the membership that make up and attend to worship," said Bray. East Side's last service will be held this Sunday, and their first service at Forest park will be on Easter Sunday.